Not long ago, I was contacted by the Kong humans about reviewing some of their products. I thought this was an awesome opportunity, so I said yes immediately, but also asked if I could do a giveaway. These days, I try whenever possible to only do reviews when I can also do giveaways. They said yes, and I asked them in addition to their sending out a prize to a U.S. winner, could they please include a lightweight toy with the package they were sending me that I could use as a giveaway for international readers — and I would pay for the international postage on my own dime. You kitties in other countries get left out so often, I always try to think of you! That’s right, just treats! No toys at all. And they also sent a second bag of treats, which many of you international kitties know might get confiscated if I try to send them to certain countries. You can tell in the photo I was not happy. I told the Kong humans I was disappointed that I did not get any toys, or something that was appropriate to send internationally and they basically shrugged it off and said too bad. So I decided to review the treats anyway, but I was also going to tell my whole story first, which I have. The Kong Moist Treats we got were duck flavored and the ingredients were mostly healthy — grain-free, no by-products, duck and chicken were the first ingredients listed. I am not sure what “vegetable glycerin” or “cultured dextrose” are, but they were the next ingredients on the label. My human said she has seen lots worse in treat ingredient lists, though. I do have to say, they were tasty! Not that moist, though — more along the lines of a hard meat stick like you see sold in convenience stores. We all liked them and ate several. The texture was a little hard and chewy for my liking so I licked them a lot before actually eating them. And I am giving away the second package to a U.S. kitty (where I know it won’t get confiscated)! The Kong humans were going to send a package from their end, but since I’ve “gone rogue” on this review and I wasn’t planning on keeping the second package anyway, I am going to do it myself and keep them out of it. 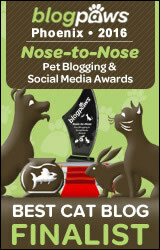 Don’t worry — I would not make you do a Rafflecopter entry just for a bag of treats! All you have to do is leave a comment below, saying you want the treats (and you have to be in the U.S.) and I will randomly pick a name next Monday, March 3. Oh, and watch for another blog post coming up tomorrow — I am hosting my very own giveaway since I feel so bad about having such a cheap one today. I hope you like it better! 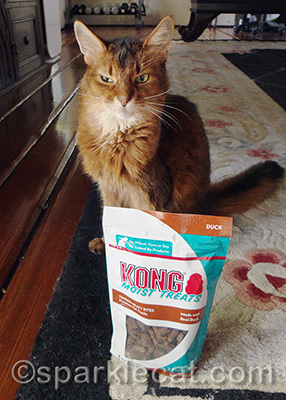 Bad Kong, but my kitties would still like the treats. Thanks. Bad Kong peeps!! Good for you for telling it like it is. My cats never turn down treats. Our brother Barkerman loves moist treats so we would like to enter to win them for him to try. Thanks for sharing! 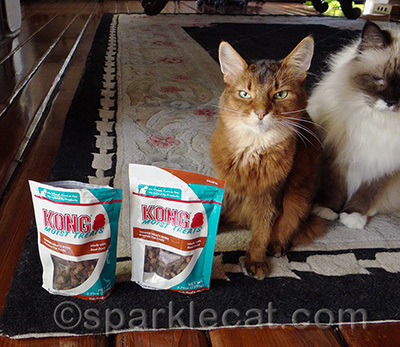 We would Love to try these – we are huge Kong buyers…Thanks a Bunch Sparkle for the Chance to enjoy some treats!!! My cat Buddy wants these thanks for the chance!!! That is just despicable that the Kong company would do that, after they agreed to send a treat. However, I would love to be entered for a chance to win the treats since I am a US resident. My boys can’t get enough of any sort of treat! Don’t enter me in the giveaway ’cause, you know, I’m a Canadian kitty. 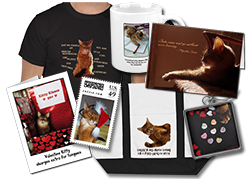 THANKS SO MUCH for thinkin’ of us international kitties. It was extra-special of you to do so. We can’t believe the Kong folks did not send a kitten toy along with the treats! Are they focusing too much on dogs! Since you tried the treats we would be more than happy to try them as well. Thanks Sparkle! You shouldn’t feel cheap, the fact you do the give away on your on dime is beyond lovely!! What you do need to do though is move to the UK and then I could send you some of my cat food to review and give away!! Basil, I wish I could! My human is always looking for cat food that I might like! Oh well, at least you got some treats out of it. Silly though: you’d think the Kong people would do a decent job. They’re a bit big to mess up like this. Yous rocks! Wes loves it when bloggers speaks their mind. Cultured Dextrose and vegetable glycerin is both “natural” products. Mommy has been writing the Business Plan for a local Food Co-op and those were 2 ingredients she has been doing some research on. Thanks for standing up for your international fans (that’s me! ).